I first attempted trikonasana (triangle pose) when I was around 17. On afternoons I didn’t have dance class, I’d rearrange the furniture in my mother’s living room to ensure I had plenty of space for standing poses, and then popped in my favorite yoga DVD. As instructed, I would dutifully take a wide stance, turn my front foot out, my back foot in, and stretch my arms out to a “T” to set up. Then, as the cheerful, unitard-clad teacher on screen (it was the early 2000s) asked me to “hinge at your hips, place your right hand on your shin, and stretch your left arm to the sky,” I would fold forward between my two legs (think prasarita padottanasana, or “wide-legged forward fold,” but with my feet still set up for triangle), walk my hands over toward my right leg to place my front hand on my shin (think pyramid pose), and stretch my left arm up. By the time I looked back at the television, I was in roughly the same shape as the teacher, and I assumed that she had gotten there the same way I had. You see, I couldn’t really look at the screen and “hinge at my hips” at the same time (not without craning my neck, anyway), so I didn’t know I was supposed to hinge to the side. Not until a year or so later when I attended a live Iyengar class for the first time and, upon observing my forward-hinge entrance into trikonasana, the teacher rushed over to me and exclaimed “WHAT are you doing? Bend to the SIDE to come into the pose!” Oh, the SIDE. That does make more sense, doesn’t it? That was my first “aha!” yoga moment. While the teacher probably could have been a little kinder with her correction, I was grateful for the clarification and amazed at what a big difference a few measly words could make: to the side. That was it. Fast forward another year. By that point, I was attending daily Anusara-inspired classes, all of which began in a seated meditation pose, with instructions to “move the flesh of your thighs out of the way.” To me, this seemed to imply that I should turn my thighs out (externally rotate them), and for months this is what I did. Until an eagle-eyed instructor spotted me, and said “Oh! Turn your thighs in.” Oh, IN. Well, that did certainly make sitting upright easier. All thanks to that one little word: in. Maybe I’m particularly prone to misinterpreting things (until I was in my early 20s, I did think the Jai Guru Deva in the Beatles' song “Across the Universe” was “Chattanooga Day-Glo”). 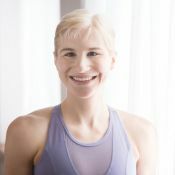 But consistently, it’s been the ostensibly small, perhaps seemingly obvious, clarifications that have made the biggest impact on my asana practice: simple cues, sans yoga-jargon, spoken clearly and plainly. Of course, there are no “one size fits all” asana instructions. What makes perfect sense to one yogi may not resonate with another. Plus, each of our bodies is unique, and alignment cues are rarely, if ever, universally applicable. That said, I want to share with you five simple alignment cues that led to major positive shifts in my yoga practice (and teaching!). I’m not saying that these cues will be game changers for everyone, or that they’ll even be appropriate or applicable for everyone. I’m sharing them in the hope that you might find a little something that resonates with you or your students, and that this may serve to continue the conversation about the importance of the things we say (and how we say them) in yoga class. Draw your low ribs back. I know not everyone is a fan of this cue, but my lower back has been a lot happier since I started applying it. One day I was starting to backbend a little in my crescent lunge, when the teacher approached me. I saw the look on her face as her eyes traveled down to my lumbar spine. I sensed what was coming. I tried my best to preemptively tuck my tail and will my kidneys to puff up like little kidney marshmallows. But instead she said “draw your low ribs in.” And miraculously, my low ribs obeyed! And my lower back instantly felt relief. In that one simple sentence, that teacher had addressed the root of my misalignment, and done so using an anatomical reference point that was reasonably familiar to me (more familiar than my kidneys, anyway). Move your knee toward the pinky-toe side of your foot. I’ve always been extra-cautious about my knees. Maybe it harkens back to my dance days, when I’d hear tell of promising ballerinas sidelined by ACL tears after landing jumps too hard (a fear that wasn’t totally irrational, as female athletes are at an increased risk for ACL injuries). It’s not like we’re doing a ton of jumping in yoga or anything, but knee health is still a major concern for many teachers and practitioners. And the cue that I’d venture a guess is given most often is “line up your knee with your second toe.” In one of my absolute favorite articles here on Yoga International, Amber Burke and Jonina Turzi explain why this cue may not be optimal for a lot of practitioners, and that many of us may actually need to aim the knee outward a little more—possibly even aiming more toward the pinky toe than the second toe—in order to actually track the thighbone and knee over the center of the ankle. I first encountered this idea while practicing side-angle pose in class a few years back. My front knee had a tendency to collapse inward, and my knees didn’t always feel so great after practicing this asana. As much as I tried to point my kneecap exactly toward my second toe, I was never quite sure if my knee was straying too far out or too far in. And even when I was reasonably sure that I’d aligned my kneecap with my second toe, it never seemed to want to stay there. I love working with this “heel up, knee out, keep it there and lower the heel” variation in pretty much any bent-knee standing pose, but I also find that even keeping the heel down and aiming my knee toward my pinky toe can make a huge difference. I no longer fret about whether or not my knee is in the “right” place. As long as I’m not moving my knee so far out that the inner edge of my foot lifts away from the floor, I’m good. And instead of fussing about whether or not my knee is in “perfect alignment,” I’m now far more interested in whether or not my knee is in the perfect alignment for me. Line up the back of your head with the back of your pelvis. When I first started practicing yoga, my biggest WTF moments were generally related to my head. As in “WTF do I do with my head in this pose?” I understood that I shouldn’t “drop it forward” or “fling it back” but (note the continuous theme here) I was never quite sure that it was in the “right” place. There were so many complex, subtle, and at times seemingly contradictory cues around the head. Even when I started to feel confident and comfortable with what I was doing with the rest of my body in yoga class, it was like my neck and head were this giant question mark perched atop my shoulders. “Tuck your chin slightly.” “Don’t tuck your chin.” Something about the hyoid bone (I like learning about anatomy as much as the next yoga geek, but “that floating bone at the top of your throat that you’ve probably never heard of” isn’t always the best point of reference). ​Line up your wrist creases so they’re parallel with the front of the mat. Okay, so technically the cue that made a pivotal difference for me was actually to “point your index fingers straight ahead” in downdog. This was a big deal because previously, I’d been taught to place my hands so that my middle fingers pointed forward. But this didn’t really work for my body. To point my middle fingers straight ahead, my hands (and therefore my arms) had to internally rotate (turn in), which didn’t feel so great for my shoulders. For me, “index fingers forward” seemed to line everything up where it needed to be. I was curious then why so many teachers kept cuing “middle fingers straight ahead,” or sometimes even “the space between your index and middle fingers straight ahead,” which seemed oddly specific, and still didn’t feel as good (for me) as pointer fingers due north. Until one day, when I was attending a yoga anatomy workshop and someone else asked the question that had been on my mind for years: “Which fingers should actually point forward in downward facing dog, and why do so many teachers cue this differently?” The teacher explained that it wasn’t so important which fingers were pointing forward, but that the wrist creases were parallel with the front of the mat. Because one person’s hands can be different from the next person’s and because, most of the time, the whole point of the “finger” cue is to end up with wrist creases straight and parallel with the front of the mat. I realize that for some practitioners, having the hands a little turned out or a little turned in might actually be optimal. But when teaching a group class, I do find that the wrist crease cue is generally a good starting place, and students can then be encouraged to inquire and explore from there what feels the very best for their own individual bodies. Perhaps more than anything, the most important nugget of wisdom gleaned from this whole convoluted finger/wrist exploration was this: When giving an alignment cue, it’s important to know why I’m giving it, not to merely repeat what another teacher has said without understanding why they said it—especially when that cue doesn’t feel right in my own body. Yoga teachers don’t have to know everything there is to know about the human body (thank God! ), but we should be open to inquiry. We should ask why. And we should remember that what’s actually going on in the bodies of our students, and ourselves, is far more important than memorizing a list of “correct” alignment cues. Now it’s your turn. What are your favorite (or least favorite!) asana cues? Was there a particular instruction that suddenly made a pose “click” for you? Share in the comments below!